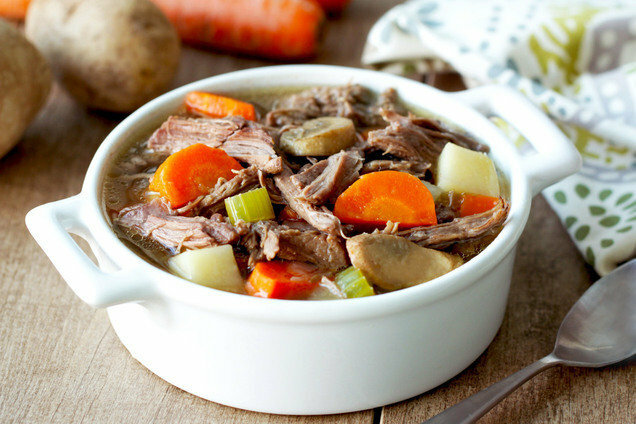 Place beef in the slow cooker. Sprinkle with garlic, salt, and pepper. Add all remaining ingredients except broth. Top with broth. Cover and cook on high for 3 - 4 hours or on low for 7 - 8 hours, until beef is cooked through. Remove and discard thyme sprigs and bay leaves. Transfer beef to a bowl, and shred with two forks. Return shredded beef to the slow cooker, and mix well. Hungry for More Healthy Cold-Weather Recipes? It's National Sangria Day, December 20th. Allow us to direct you to our newest recipe! Click "Send to a Friend" to share this recipe from the comfort of your very own home.